Robert A. Frink, 83, of Torrington, CT, peacefully passed away Wednesday, December 5, 2018, at his home surrounded by his family. He was the beloved husband of Phyllis (Czausz) Suthowski Frink. Bob was born January 8, 1935, in Albany, NY. He was employed by the State of Connecticut as a truck driver until his retirement. An avid fisherman, Bob also took great pride in landscaping his yard, with both flower and vegetable gardening. He loved spending time with his family and numerous friends. 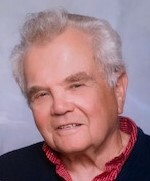 In addition to his wife, he is survived by three daughters, Barbara Soucie of Venice, FL, Tina (Whalen) Craft of Torrington; Jennifer (Suthowski) Hardwick of Torrington; one son, Stephen Suthowski and his wife Stacey of Woonsocket, RI; his adopted family, the Zanetti's; nine grandchildren, Jordan and Taylor Soucie, Abigail, Adam and Lucas Whalen, Emma and Ava Hardwick, Amber Chiles and Eden Suthowski. Funeral services will be held on Tuesday, December 11, 2018, with the cortege leaving at 9:30 a.m. from Cook Funeral Home, 82 Litchfield St., Torrington, to Immaculate Heart of Mary Church, (Our Lady of Hope Parish), 14 Birge Park Road, Harwinton, CT for a Mass of Christian Burial at 10:00 a.m. Burial will follow at St. Francis New Cemetery. Calling hours will be held on Monday, December 10, 2018, from 6:00 p.m. to 8:00 p.m. at Cook Funeral Home.